The 2006 movie year officially ends in about an hour with the Academy Awards. I figure if I’m going to get my opinion out there, now’s the time. Both Kyla and myself saw an absurd number of films this year — maybe we really needed the escape, or maybe it was just a great a year for this particular art form. Either way, we spent some time going over the best 2006 had to offer, and boiled down the many worthy movies and individual performances into nice little top ten lists. We did these independently of one another, not wanting to influence each other’s lists too much. Nonetheless, you’ll find there’s a good amount of crossover, which just proves these are all really worth seeing. I figure I’ll periodically update with the inevitable adjustments to my presidential picks as things appear to change. So far, my “Mike Huckabee #1″ pick for the Republican Party isn’t bearing any fruit, though there’s obviously still plenty of time. I’ll continue to insist that primary voters would fall in love with him if he was given enough exposure. I am beginning to wonder if it’s really president he’s running for, though. Mitt Romney, my #2 pick, is already launching campaign ads– now this is a man who’s serious about being president. The Mormon issue is still getting a lot of attention, and it will continue to throughout the next 20 months (yes, we’ve got that much more of this left to look forward to). But Mitt’s already charming the media and seems to be getting more coverage lately than the alleged “leaders” (Giuliani and McCain) combined. Speaking of the favored candidates, Giuliani has grabbed much of McCain’s lead in the polls since he officially announced. You can count on Rudy’s issues with social conservatives to boil up to the top of the public discussion very soon, but I’m obviously dead wrong in thinking Rudy’s only the fifth most likely contender. And as for McCain, well, he’s faltering early. He could surge back, but right now things just aren’t trending his way. So if I had to guess the 2008 GOP ticket today, I’d say we’re going to see Romney/Huckabee. Yes, Mike Huckabee has got to be the VP choice for any of the other guys, and he balances Romney geographically while solidifying his cred with religious conservatives. That’s one hell of a strong ticket. After Romney, Giuliani appears next most likely to win, followed by McCain. No one else is probably going to matter. So what of the Democrats? I’m still hopeful for John Edwards — the guy could have so much going for him. He’s made some gaffes though — in particular, he hasn’t effectively dealt with the anti-Catholic bloggers on the payroll story. It may be silly, but Fox would like nothing more than to be able to use it to somehow define his candidacy. Edwards needs a more firm, vocal presence, and fast, if he wants to keep up a lead in Iowa and among the netroots he’s been courting. Barack Obama is the new Hollywood favorite, but he still isn’t showing enough substance to transcend his rock star persona. Despite being the best orator of his group, I think when we get to the debates voters will start feeling like the emperor has no clothes (or experience). Happy to be proved wrong about this one, though. So, Hillary? Yes, it’s probably Hillary. I prefer either Edwards or Obama, but she is, as I’ve said before, the default. I don’t think anyone can gain enough momentum to surpass her, which is unfortunate. I don’t have much sense as to who will be her running mate — Wesley Clark is definitely possible, or perhaps we’ll seeÂ a governorÂ from a key swing state (Mark Warner, Tom Vilsack, Bill Richardson). And what would the results be of Romney/Huckabee versus Clinton/Clark in 2008? 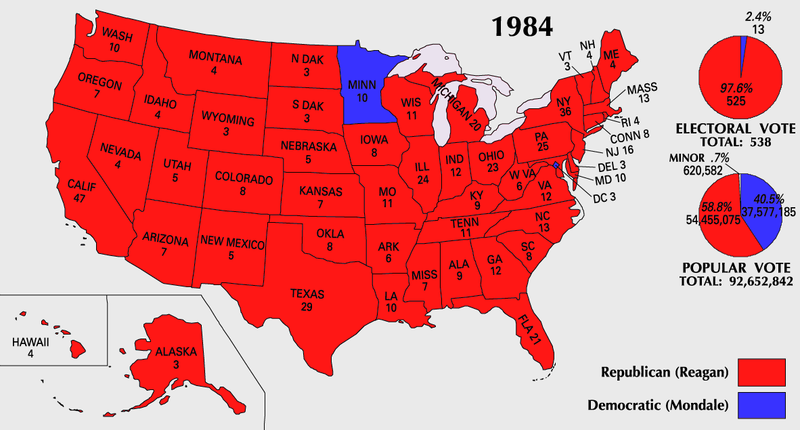 I’d be surprised if that Dem ticket carried more than Mondale did in 1984. But cheer up kids, it’s only February ’07! If you’re reading this, you probably already know a bit about my mother’s circumstances. Even so, I feel like I need to write about it in here at least a little bit, just so it’s all on the record. If you knew my mother prior to this past October, you knew her as an energetic, healthy person. You probably also knew her as the morning show co-host and news director on WDRC-FM, a job she proudly held for over ten years. She would get up at three in the morning, then come home at noon to be a mom for the rest of the day. I’m the sort of person who’s much more content to sleep in, so I could never imagine doing all that. She wouldn’t have lived any other way, though. On October 14, 2006, she was out shopping when she felt some chest pains. She had no history of heart problems, but she was very aware of the symptoms from her work with the American Heart Association. She came home, and when the symptoms persisted, my father took her to St. Francis Hospital in Hartford. I was working at the video store that night, when I got the call she was being examined for chest pains. My father told me not to worry, that whatever the problem was, itÂ didn’t seem to be too serious. The next morning, I got another call telling me to come to the hospital as quickly as possible. She had a heart attack while she was in the ER that evening, though it didn’t seem like a big one. A cardiac catheterization was scheduled for the following day, to scope out the damage and see if a simple stent could fix it. The catheterization revealed a blockage in a small artery, which should not have been too difficult to take care of. But somehow, during the procedure, something horrible happened. The major artery to the left side of my mother’s heart bisected while the doctor was performing the catheterization. I don’t know if this was somehow the fault of the doctor, if there was some kind of weakness in the artery already that no one could have foreseen, or if there was some other factor involved I haven’t even considered. All that remains open to investigation. The important thing is that people don’t generally survive that sort of event — there is immediately massive internal bleeding and the heart stops receiving blood. She was rushed into open heart surgery and the artery was repaired, but by this time her heart hadn’t been getting blood for somewhere from 20 to 40 minutes. Doctors couldn’t get it started again — it was essentially dead. They decided they needed to hook her up to a ventricular assist device, a machine that would connect directly to her arteries and take over the pump function for the left side of her heart. This operation was successful, but the obstacle of clearing her chest of blood and fluids while all her other organs were failing from the trauma was a big one. After she was on the left ventricular assist device (LVAD) for about a day, it became clear that her right heart was failing from being overworked. Another open heart surgery switched her to a biventricular assist device (BiVAD). Things looked very grim about 12 hours later — pretty much as grim as it gets. My mother, swollen and unrecognizable, connected to dozens of humming medical contraptions, lay with her chest still open in intensive care. Her lungs were filled with fluid and not getting nearly enough oxygen for survival. A priest gave her the Last Rites, and my father, sister, and I said goodbye to her. It was an indescribably excruciating moment. Shortly afterward, a doctor remembered an old oscillator which was literally in the hospital’s basement. He couldn’t think of a more powerful engine in the whole place, so he brought that up in a last ditch effort to save her lungs. It turned out to be powerful enough — her oxygen levels rose dramatically, and thanks to the shape she was in when all this occurred, all her vital organs rebounded (except, of course, her heart). She was still about as critical as you can get, but she wasn’t dead. The device her heart was on was short-term — it could only last about a week. There were other kinds of VADs that a patient could live onÂ for a year or more, but if she was to survive long-term, a heart transplant would eventuallyÂ be necessary. This meant transporting her to Massachusetts General Hospital in Boston, with her chest open and in a medically induced coma. After a couple of days, a kind of super-ambulance took her up. Dr. MacGillivray took her case at MGH, and his reputation makes him out to be pretty much the best cardiac surgeon you can get anywhere. He was still hopeful from the reports he had received that her heart might recover, but his mind changed when he performed the surgery (open heart #3 in the span of a week) to move her over to the long-term BiVAD. As soon as she could be stitched up and regain consciousness, she would start on the path toward getting on the transplant list. It was nearly a month after the heart attack that she finally woke up, with thankfully no brain damage. It was as rough a situation as anyone could find themselves in — with no memory of anything that had happened, suddenly her health and her life as she knew it were gone. She was determined to get out of that hospital, though, and learned very quickly to live with the VAD as a part of her life. Rehabilitation was steady — she had lost a ton of muscle being comatose for weeks, and it was difficult for her to eat anything with two chunks of metal sitting in her chest pumping her blood — and psychologically coming to terms withÂ needing a new heartÂ was very difficult. She was able to come home for Christmas, though, making her the first patient ever discharged from Mass General with a BiVAD as a bridge to a transplant. Her progress was pretty incredible, all things considered. She was home for a while, with home health aides and nurses coming by every couple of days to make sure things were going okay. A couple weeks ago, though, it became apparent that her blood cells were being shredded — a risk of being on a BiVAD. She had to go back up to the hospital for some transfusions, while they tried to figure out if it was safe to switch her back to just the LVAD (the risks with that device are substantially lower). The consensus seems to be yes, that needs to be done. Last week she had a stroke in the hospital — another risk of having your blood artificially pumped. It seemed only to affect her vision, and she is recovering from that much more quickly than anyone expected. Until they are sure that’s taken care of, they cannot perform the LVAD surgery, but it looks like that might be able to happen within the next month if everything keeps going well. She is at the top of the heart transplant list in the region because of her circumstances, but high levels of antibodies make it hard to find a good match. We’re all hoping that, once she’s healthy enough again, she gets the right heart and can get off these machines for good. Until that happens, we just have to do the best we can with the technology that’s available. You are currently browsing the Rich Bradley, The Blog blog archives for February, 2007.